As we lay to rest and pay tribute to Volunteer Joe O’Connor, may I on behalf of the Republican Movement extend our heartfelt sympathy to his wife, Nicola, his children, Sean-Paul, Joseph and Eamon, and his mother, Margaret, and also his entire family circle. You have lost a loving husband, father, son and brother; we have lost a dear friend and brave comrade. Joe came from a family with a long Republican tradition who gave a lifetime service to their country. Joe proudly followed in the footsteps of his late maternal grandfather, Francisco Notarantonio, a veteran Republican who also lost his life at the hands of pro-British elements. As news of the unprovoked murder spread across West Belfast and the realisation that the perpetrators came from within his own community the shock and revulsion was tangible. Let there be no doubt; contrary to the deliberate misinformation being peddled by the Provisional movement and aided by RUC sources, those responsible for this foul murder have been clearly identified. Shame! Shame on you! The sinister attempts of a cover-up by Sinn Féin spin-doctors, to divert and turn Republicans who are opposed to the Stormont Deal sell-out against each other has been exposed as agent provocateur tactics. Many questions arise as to why, at this particular time, the Provisional leadership chose to sanction such a dastardly act. It cannot be ignored that it comes in the wake of mounting political and internal pressure over decommissioning and Patten issues, all of which the leadership have conceded unbeknownst to their followers. 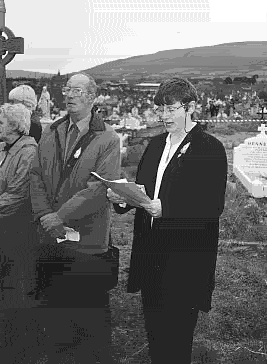 Is the murder of Volunteer Joe O’Connor part of the stepping stone strategy to a United Ireland? Or is this the act of a leadership desperate and bereft of political direction? The people of West Belfast and beyond will judge in the coming weeks and months. Volunteer Joe O’Connor was clear in his opposition to British rule; he did not dissent from Republican principles or ideals. He refused to accept British rule under any guise, irrespective of who administered it, whether it be Peter Mandelson, David Trimble or Martin McGuinness. All are members of the British establishment, all administer it and now we witness how far the Provos are prepared to go to uphold it. They are now reduced to an armed militia of the British State. The Volunteers of Óglaigh na hÉireann have shown great restraint under blatant provocation. Their discipline and dignity has been a tribute to Joe’s memory. In conclusion: This is an extremely volatile time and we stress to all Republicans to remain calm and vigilant and not to be drawn into what is clearly a British inspired trap. Republicans have withstood similar attempts in the past by the Brits to undermine and break their spirit; it has been young men like Joe who defiantly resisted and who will continue to resist until British rule is ended. This entry was posted in Statements and tagged Joe O'Connor, Marian Price, Sinn Fein. Bookmark the permalink.